I have said it before, I will say it again. I am a huge Surface fan. The devices created by the Surface team dating back to original Surface RT release have always been extremely well built and stunning to look at. The original Surface certainly did have reliability and usability issues, as I mentioned in my Surface Laptop review, but they have always had a brilliant design language. The goal of Microsoft hardware, under Panos Panay, is to create and innovate in new product categories and not to create "me too" products in already established categories. The Surface Book and now the Surface Book 2 are the epitomai of that goal. The Surface Book 2 is by no means a standard laptop. It is a pretty unique product that no other company has successfully been able to replicate. At a glance, it does appear to be similar in design to any other ultrabook out there, but upon closer inspection, you see that it is so much more. 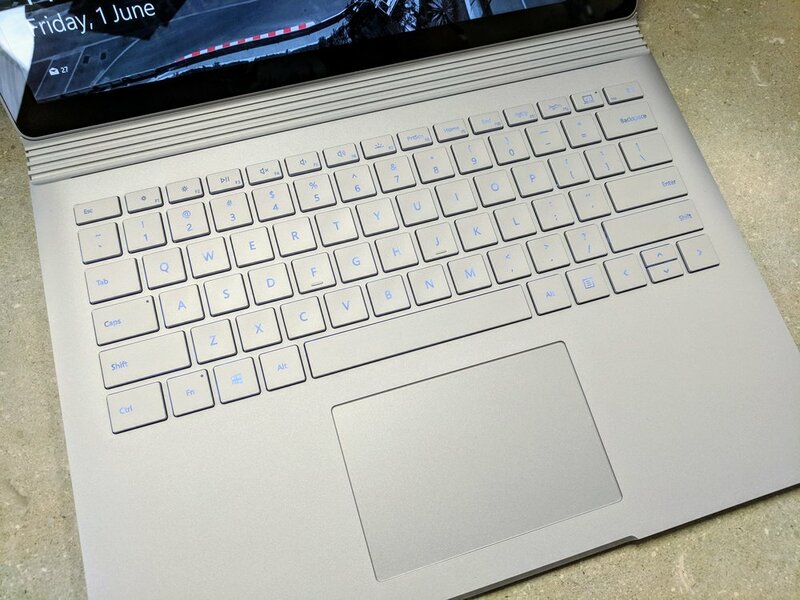 The Surface Book 2 is unique because unlike other two-in-one devices that allow the screen to be removed the base, it isn't limited performance wise thanks to its incredible spec list and very creative implementation of a dedicated GPU. Take the regular Surface Pro for example. The keyboard/base unit is nothing more than a cover with a built-in keyboard. 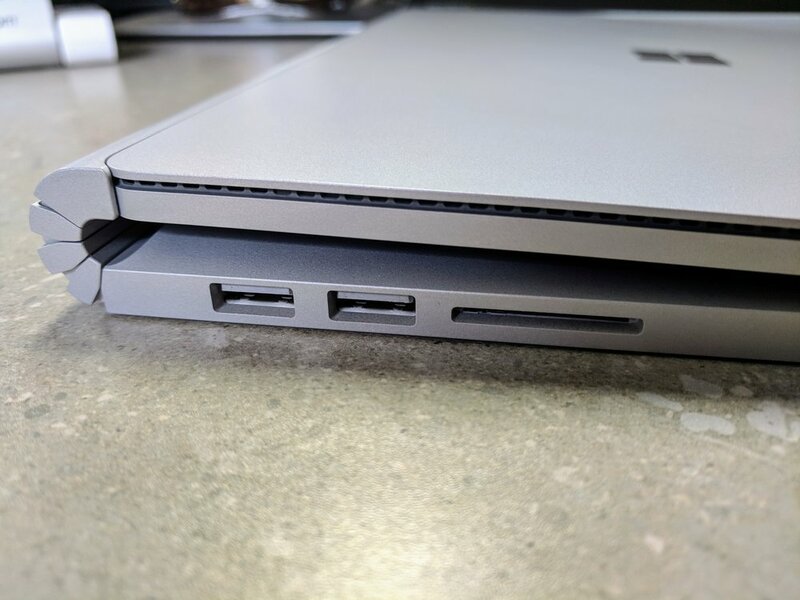 The Surface Book 2 offers users a very powerful PC experience when attached to the base. The 15" version the Book 2 can be configured with a Nvidia GTX 1060 GPU, which is more than capable of handling most games, but with the simple press of a button the screen of the Book 2 can be removed from the powerful base leaving you with a 13.5" (or 15") tablet. With the press of a button, the Surface Book 2 becomes a powerful stand alone tablet! The Surface Book 2 doesn't come with much in the box. It is very utilitarian. Aside from the Book itself, the only other items in the box are the Surface power supply and a small quick start manual. Sadly, despite the fact that this notebook sells for upwards of $4,000 CAD Microsoft does not include the Surface Pen. Yes, I know, accessories like the Pen are high margin items for PC makers, but this laptop, like other top-shelf devices, is already high margin! To have to shell out another $150 or so for a Pen is unfortunate. One thing that I really did not enjoy when I reviewed the Surface Laptop, was its keyboard. It was fine, but the key throw was not as good as I was expecting, especially when I compared it to my 2016 Lenovo X1 Carbon. The keyboard on the Surface Book 2 however, is a thing of beauty. The key throw is perfect, the sound is perfect, everything about it is nearly perfect. I have been using the been using the Book 2 almost exclusively for two months now and aside from the less than stellar back-lighting of the keyboard I cannot find anything to complain about on this front. Every keyboard should be this good. The Surface Book 2 brings the power with a GTX1050 or 1060. This isn't the top-end of the GPU space, but for the vast majority of games you could or would want to play on a portable machine will run great on this machine. I am by no means a gamer, at least not anymore. My gaming on this PC was limited mostly to playing F1 2017 from Codemasters. With the settings dials up, the game almost never stuttered. If it did, it was because some other rogue process outside the game decided to spike, causing the overall system to slow down. Slightly frustrating, yes. I binned my car on more than one occasion thanks to a momentary lag from the system. However, despite those few lags, I got exactly what I expected out the Surface Book 2 when gaming. One note to be aware of when using the Book 2 for gaming is the fan noise. Nearly every time I fired up F1 2017 the fans would run very loud in an effort to keep the machine cool. It achieved the cooling part better than I had expected. However, the noise created by the fans, which vent at the top of the base neat the fulcrum hinge was very loud and very irritating. This kind of goes without saying. One the stand out features of this device is its power, but also the ability to remove the screen and take advantage of a high quality, lightweight tablet. It took some getting used to, having a tablet so large when you're used to devices the size of an iPad mini, but that transition didn't take long and in no time using the device as a tablet become second nature. The clipboard is heavy though, so using it for extended periods will start to wear you down. The Surface Books 2 has an absolutely stunning 3:2 ratio display that is very easy on the eyes. Working with the display for hours on end does not lead to tired or strained eyes because it is very precise and clear. Circle back to 3:2 ratio for a moment. This aspect ratio is something every professional/business class laptop should be adopting. The days where 16:9 and 16:10 laptops were the go to are or should be over. Laptops are productivity devices mostly, not multimedia consumption devices. Most of that "play" time has moved to iPads and smartphones. Working in Excel or Power BI on a 16:9 display is a less than fun experience. I hope that other PC makers, I'm looking at you Lenovo, start to adopt this aspect ratio on a larger scale as the laptop market continues to evolve. One of the things I praised about with the Surface Book 2 was the keyboard. It is great, but one thing I never thought I would have a need to complain about was a keyboards backlight. The backlighting on the Book 2 is some kind of awful. When activated in anything less than near-complete darkness, it renders the keys nearly invisible. Fortunately, there is a dedicated key to turn the back-light off. Something I did almost immediately after turning the Book on. I'm not sure why Microsoft made the engineering decisions they did when designing the clipboard portion of the Book 2, but the positions they selected for the power button, volume buttons and headphone jack (its existence I am very thankful for, by the way) are absolutely horrible when using the Book. The power button and volume rocker are located on the outside-edge, top-left of the clipboard. I am constantly finding that I have accidentally turned on the computer while carrying it or transporting it in my laptop bag. I also find myself hitting these keys when I am taking the clipboard off the base and turning to portrait mode. Like my smartphone, when turning to portrait, I rotate the device counterclockwise. When done with the Book 2, the button position is almost guaranteed to lead to an accidental powering down of the machine. I do not know why Microsoft had to put them there, perhaps they had no choice, but having them on the outside edge of the right-side of the clipboard, much like the vast majority of mobile devices today, would have been a far more logical choice. The headphone jack, who's existence I am grateful for, is in the upper right-hand side of the clipboard. The exact location I think the power and volume rocker should be. I understand the jack needs to be on the clipboard, so you can use headphones when in tablet mode, but to location selected really limits your range of motion unless you are on a very long wire. I mentioned this earlier, but it is worth bringing up again. The review unit I have here in front of me retails for nearly $3,900 CAD. That is very expensive. The device is geared towards creators and productivity power users. No "average" consumer is going to even give this computer a second look. If you are buying this device, you are likely going to need or want the Surface Pen. One would assume that a device this expensive, with this sort of margin, Microsoft would perhaps feel slightly charitable and include the Pen at no extra charge. Conclusion/Should You Buy the Surface Book 2? This is a tough one. If you have the cash to burn or simply have to have the latest and greatest, then yes buy this laptop! If you need to have an extremely powerful notebook for your work, say, designer, videographer, etc. Then yes, but this laptop! If you are looking for a solid, well designed, minimalist notebook that is built to last I would steer towards the Surface Laptop. I reviewed it last fall and really enjoyed it. However, if you are thinking of picking this up to be a gaming laptop, I wouldn't recommend it. It can game, yes. I really enjoyed playing F1 2017 on the Surface Book 2, but heavier games are sure the lag and struggle to keep up. The Surface Book 2 with a 15" display and GTX 1060 will fair better but will also put a larger dent in your wallet. If gaming is your objective, look to traditional gaming rigs for that. 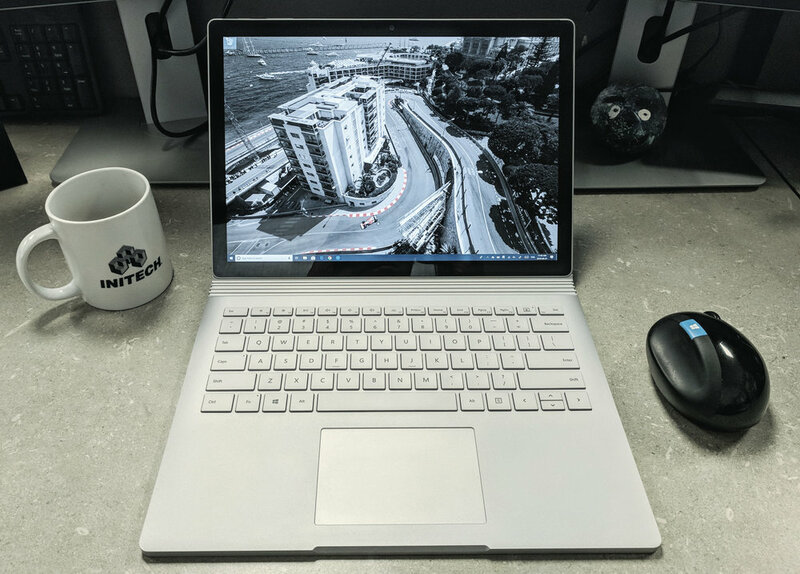 The bottom line is; if you are a power user, and want a notebook that can literally do everything, and do it very well, the Surface Book 2 is for you. Just be prepared to pay for that robust functionality. If you're looking for a good mouse to go along with your Surface Book or Laptop, give the Microsoft Sculpt Ergonomic mouse some consideration. I also reviewed it last year and am still using it to this day. You can check that out right here. Thanks for reading my Surface Book 2 review. I would love to hear from you in the comments below.